We've found another way to make our patients smile! 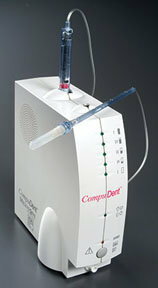 We have a new computer-controlled anesthetic delivery system, The WAND. The WAND lets us administer injections with little or no discomfort to our patients, since the flow and volume of anesthetic are delivered slowly, below the pain threshold. The system even places a drop of anesthetic at the site of injection, prior to needle insertion, preparing an anesthetic pathway. Another benefit we can offer our patients by using The WAND, is that we now need only numb the actual teeth we're treating, rather than the entire lip or face. This means that we can eliminate residual numbness, drooping lips, and the resulting difficulties of resuming normal activities. This rapid recovery allows you to schedule dental procedures without canceling the rest of your day's responsibilities. All in all, The WAND has given our patients another reason to be relaxed about their dental treatment. Instead of wariness or apprehension prior to an appointment, they can look forward to a stress-free experience, and enjoyable results from our excellent dental care.